The Labour Party Conference in Bournemouth gives support to Churchill’s government by 2,413,000 votes to 170,000. Churchill makes ‘blood, sweat, tears and toil’ speech. Queen Wilhelmina and the Dutch royal family arrive in London. 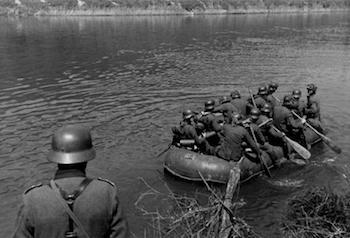 Supported by waves of Luftwaffe Stuka dive-bombers, the two German Panzer Korps of Heeresgruppe B establish bridgeheads across the Meuse river, tearing a 50-mile gap in the French defenses between Dinant and Sedan. The 7th Panzer Division (Rommel) is the first division across. Dutch troops withdraw to their second and final line of defense on the Amsterdam-Rotterdam-Utrecht line. German aircraft begin to operate over Iraq in support of the rebellion by anti-British Iraqi forces. The British Chiefs of staff approve a major raid against the French port of Dieppe. Initially code-named ‘Rutter’, the plan had been under consideration since March by Admiral Lord Louis Mountbatten, Chief of Combined Operations, who wanting to explore the problems of an opposed landing on the French coast. The siege of Leningrad continues. Tanya Savicheva, a young girl, writes in her address book, “Mummy 13th May at 7.30 morning 1942. The Savichevs are dead, all dead, only Tanya remains.” Her book also lists the death of her brothers, grandmother, and two uncles. Evacuated to Gorky on the Volga, Tanya herself dies of chronic dysentery in the summer of 1943. For the first time in the war, the British now claim more German prisoners than the Germans have British. The Royal Navy begin the bombardment of Pantelleria Island, between Tunisia and Sicily. The allies take Sant’ Angelo and Castelforte, thereby opening the way to Rome. Jail Hill and other key Kohima features are recaptured by the British. The British Royal Family and allied military leaders attend a thanks giving service at St. Paul’s Cathedral. Crown Prince Olav, some members of the exiled government and the head of the allied mission, Gen. Sir Andrew Thorne arrive in Oslo. Rear Admiral BrÃ¼ning, the commander of German naval forces, arrives at Felixstowe to sign the unconditional surrender of all boats under his command. The last pockets of German resistance in Czechoslovakia are crushed by the Red Army. U.S. troops capture Del Monte air base on Mindanao. The Australians clear the Wewak peninsula in New Guinea.